From London we find the M4 and M5 to be the fastest route. 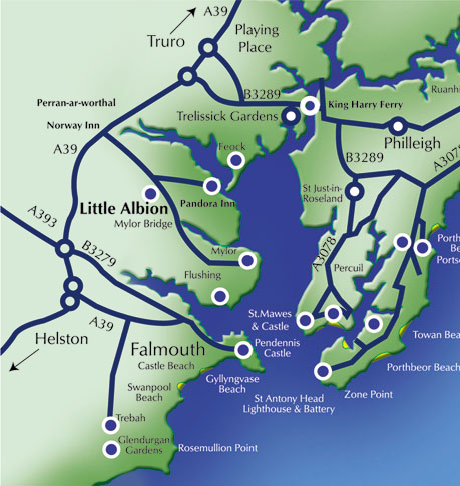 Come off the M5 at J31 at Exeter and take the A30 via Okehampton, Bodmin, and then take the road to Truro. Bypass Truro and from Truro follow the A39 towards Falmouth. Take the first left after the Devoran roundabout at Perran-ar-Worthal, (signed to Carclew). The turning is almost opposite the Norway Inn seen on your right. Take a left turn at the first T-junction, and turn left again at the next crossroads approx 200m further on. After approximately one mile continue straight ahead past a fork off to the left, towards Mylor Bridge for approximately 200m (now Bells Hill). We are the first visible property on the right-hand side. You will see the pink cottage ‘Little Albion’ and then Albion House, a slate hung house with narrow vehicle entrance and round lawn.